If you looking for guitar lessons, beginner to Advanced, young to adult, you have come to the right place! I offer the very best in quality instruction in an excellent facility. I teach guitar, bass, songwriting, computer recording, music theory, and will work with any instrumentalist on improvising or general musicianship. Your satisfaction is my best advertising. The “testimonials” say it all! Rivers Music is a private lesson studio in Hyde Park, Cincinnati. 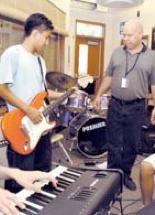 The instructor, Brian Rivers has years of experience as both a private and classroom music instructor. Brian takes pride in striking a balance between fun and quality education. Brian is a very warm and relaxed teacher who has a strong commitment to musical excellence, education, and having a personal connection with his students. He tailors the lessons and methods to the individual student; child to adult, beginner to advanced. He plays a wide variety of styles, Rock, Jazz, Blues, Country, Folk, Reggae, Finger Style, and Latin. Brian has appeared on many recordings and performed at numerous music festivals throughout the United States. The facility and teaching environment contributes to the quality of instruction. It includes a library of guitars, books, handouts, recording equipment, and internet. It provides a quiet and focused environment for learning. The studio waiting area has complimentary WiFi and there is a coffee shop next door. The studio is conveniently located within two blocks of Hyde Park Square and Rookwood shopping center for the quick shopping errand! Remember, not all guitar teachers are the same and the reason people choose Rivers Music and Brian Rivers over other lessons options is quality, plain and simple. Returning students get scheduling priority and must ﻿complete the registration form below, and payments must be received by Monday, Jan. 5, 2015﻿. The Spring 2015 schedule will open to the general public (new students) on Tuesday, Jan. 6, 2014. Payments can be made by cash, check, credit card or e-check. Checks should be payable to: Brian Rivers Music, LLC. Brian teaches M-F, you can view the current schedule by clicking the schedule button below. If there is not a time that works for you, contact Brian to be added to the waiting list. Lessons are generally $30.00/ half-hour private lesson. 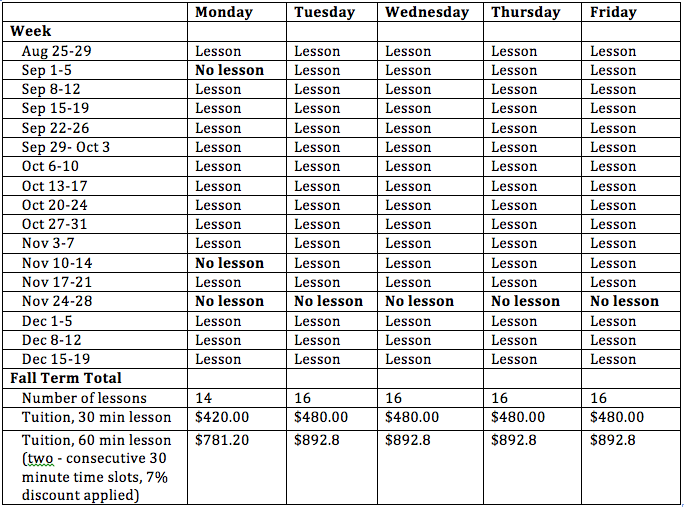 There is a 7% discount available for consecutively scheduled lesson times. Payments can be made by cash, check, credit card or e-check. Checks should be payable to: Brian Rivers Music, LLC. For lessons scheduled at 3:00 pm or later, you are allowed (2) two make-up lessons per session, subject to teacher availability and with three days notice. Students who do not cancel lessons with three days notice or simply "no-show" do not qualify for potential make-up lessons. If a Student knows they will miss a lesson please call and let Teacher know as soon as possible. For lessons that are scheduled at 3:00 pm or later the tuition is not refundable unless 1) classes are cancelled by Brian Rivers Music, LLC or 2) if Brian Rivers Music, LLC is notified in writing or by email that there has been a significant change in the employment or health status of the Student or guardian which case the unused remaining prorated portion or the term will be refunded in full. Notwithstanding anything herein to the contrary, all refunds remain at the sole discretion of Teacher. For lessons that are scheduled before 3:00pm the classes can be cancelled and refunded or rescheduled without penalty by giving notice 24 hours or more in advance. Students who do not cancel or reschedule lessons 24 hours in advance are billed at full price. Parking is available on the street in front of Brian Rivers Music, LLC. Do not park in the private parking lots of the surrounding businesses. Do not park behind the house or block the driveway with an unattended vehicle, as driveway is shared with the neighbors. Why Rivers Music is the premier lesson choice in Cincinnati! √ Real results - Many of Brian's former students are now professional award winning musicians themselves. In Hyde Park almost at the corner of Wasson Rd. and Edwards Rd., two blocks north of Hyde Park Square. If you looking for guitar lessons for yourself or child, you have come to the right place. I will help you become the player you always wanted to be! I offer the very best in quality instruction in an excellent facility that is spacious and quiet. I teach guitar, bass, songwriting, computer recording, music theory, and will work with any instrumentalist on improvising or general musicianship. If you are looking for experience and value, this is the place! Your satisfaction is my best advertising. The “testimonials” say it all!